The Hard Rock in Downtown San Diego is located at 207 5th Avenue in San Diego. 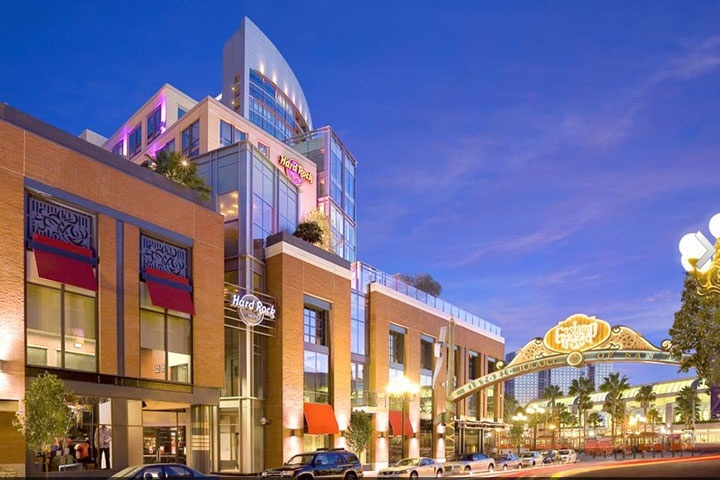 Located next to The Metropolitan and Petco Park is the luxury Hard Rock Hotel. The Hard Rock Hotel chain has started to sell luxury condos in the downtown San Diego area. Price ranges for the Hard Rock condos will vary from $500,000 - $1,700,000 with homeowners association dues of $554/month. The condos sit in the prime area of the Gaslamp district with great restaurants, night life and close proximity to the water and San Diego Padre games! The hotel is offering 420 suites available for sale with currently 17 condos listed for sale. It's the latest trend for Luxury condos like the Westin & W Hotels to offers suites for sale. The condos are available for the hotel to rent out to visitors for a contractural fee. Below are the current Hard Rock downtown San Diego condos for sale. Interested in other areas of San Diego Real Estate for sale? Questions? Let our team of San Diego Realtor Associates help you. Please contact us at 1-888-990-7111 today!